Beauty doesn't always mean silver and gold. The Magnificence white plates blue and gold rim is a mix of sophistication with just a little rebel thrown in there for fun. They are an excellent choice in plastic dinnerware and perfect for your special occasion. These disposable plates for weddings are the pinnacle of class and youthful exuberance. You'll love the look for your wedding reception or rehearsal dinner. A Party Source has many types of plastic plates for weddings and so much more. Everything you need to create that once in a lifetime event is at your fingertips. 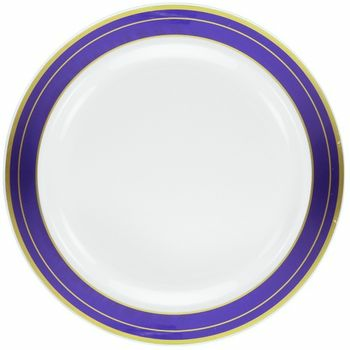 Magnificence White w/ Blue and Gold Rim 10.25" Plastic Banquet Plates, 10ct. Magnificence White w/ Blue and Gold Rim 9" Plastic Luncheon Plates, 10ct. Magnificence White w/ Blue and Gold Rim 7.5" Plastic Salad Plates, 10ct. Magnificence White w/ Blue and Gold Rim 6.25" Plastic Dessert Plates, 10ct. Magnificence 14oz. White Plastic Soup Bowls w/ Blue and Gold Rim, 10ct. Magnificence 5oz. White Plastic Dessert Bowls w/ Blue and Gold Rim, 10ct.